Fitness Professional’s Guide to Strength Training Older Adults, Second Edition, by Tom Baechle and Wayne Westcott. Properly planned strength training workouts that progressively stress the prime mover muscles will produce some degree of tissue microtrauma. Following each exercise session, the stressed tissues undergo repair and building processes (muscle remodeling) that result in slightly larger and stronger muscles over time. These beneficial physiological adaptations typically require 48 to 72 hours to occur, and it is during this time that the next strength workout should be undertaken for best training results. Thus, strength development is enhanced by training the same muscles again 2 or 3 days after the last workout. Training less frequently passes over the optimal period for stimulating progressively greater levels of strength. Conversely, training too frequently prevents muscles from recovering adequately and ultimately from developing to their full potential. The actual amount of recovery time needed to achieve maximum muscle-building benefit will vary because of individual differences. Therefore, you must monitor your clients’ improvement carefully to determine the most productive training frequency for them. Because the only way to determine a client’s most productive training frequency is through trial and error, maintaining a detailed record of each client’s training sessions is important. When the muscle recovery and building period between workouts is appropriate, a consistent and progressive increase in loads used and repetitions performed should be possible. Although most strength training textbooks recommend three strength training sessions per week (Baechle and Earle 2005; Baechle and Earle 2008; Fleck and Kraemer 1997; Westcott 1995a), some research indicates that two strength workouts per week may be as effective (Braith et al. 1989; DeMichele et al. 1997). Specifically, twice-a-week strength training appears to be highly productive for developing strength in men and women over the age of 50 (Stadler, Stubbs, and Vukovich 1997; Westcott and Guy 1996; Westcott et al. 2009). In 1989 Braith et al. found that two exercise sessions per week produced only 75 percent as much strength gain as three training sessions per week. But a 1997 study from the same university (DeMichele et al. 1997) showed the same strength development from two or three weight training workouts per week. 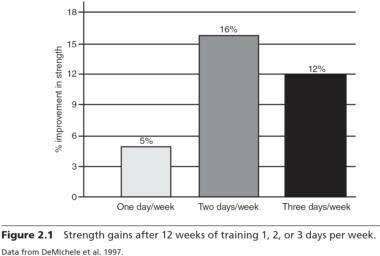 The 2- and 3-day trainees showed similar strength gains (figure 2.1), but the subjects who trained only once a week did not achieve significant strength gains. In a study by Westcott et al. (2009), 1,725 adult and senior subjects showed no differences in muscle development between the 2-day-a-week and 3-day-a-week exercise groups after 10 weeks of strength training. All the participants trained according to the ACSM guidelines, in small classes under close supervision. Both the Tuesday–Thursday trainees and the Monday–Wednesday–Friday trainees added 3.1 pounds (1.4 kg) of lean (muscle) weight over the training period. The results of these studies indicate that for older adults, strength training on 2 nonconsecutive days per week may be as effective as more frequent exercise sessions. Apparently, during the first few months of strength training, two exercise sessions per week provide the essential stimulus for muscle development, and little or no additional muscle-building benefit results from a third weekly workout. A well-designed study by McLester and colleagues (2003) revealed that advanced strength exercisers, both young and old, required more than 2 days of recovery time to maximize their training response. Following a relatively hard strength training session on Monday, muscle strength was well below baseline (initial) level on Tuesday, slightly below baseline level on Wednesday, significantly above baseline level on Thursday, and the same amount over baseline on Friday. That is, these subjects were not fully recovered in 48 hours, but had optimized their muscular response to the training stimulus after 72 hours. Training consistency is as important as frequency. Clients who miss scheduled training sessions undermine the ability of the body to achieve progressive adaptation to the strength-building stimulus—because it is absent. Training the same muscles too frequently, say, 2 days in succession, is also counterproductive because time is insufficient for muscle recovery and remodeling. Using some of the strategies discussed later in this chapter, you can find ways to motivate older adults so that they do not miss scheduled workouts.